In advance of a performance of Steve Reich’s Different Trains at Edge Hill in Liverpool – in the presence of Reich himself – I interviewed Robert Ames of the London Contemporary Orchestra about the prospect of playing the piece in the world’s oldest working railway station. This is a slightly longer version of a piece that originally appeared in Bido Lito magazine. There’s so much romance in a railway station. Sometimes it may be tricky to discern – as your ticket gets jammed in the barrier and your super-heated coffee breaches its plastic lid and cascades down your forearm – but beneath all the hurried inconvenience and inaudible announcements there remains the fact that stations are where adventures begin and end. For some, stations are portals to another phase of life; they are also places where the world’s Billy Liars will never have the courage to board their trains. They are places of meetings and separations; they are temples to the possibility of somewhere else. The coming of the railway heralded the arrival of the modern world and, as the source of so much narrative potential, it’s no wonder that stations – and the journeys that connect them – have also catalysed the creation of memorable art. Whether the railway in question runs to distant sun-bleached horizons as in Sergio Leone’s Once Upon a Time in the West, or simply out beyond the edge of repressive suburbia as in Bronski Beat’s evocative British Rail-era video for Smalltown Boy, those endless parallel lines are the tracks on which some epic tales have run. It may be, however, that it’s the celebrated American composer Steve Reich who has tackled the darkest railway journey of them all. Reich is one of the pioneering minimalists who stripped music back to its constituent parts in the 1960s, then rebuilt it using repetitive phrases, shifting patterns, tape loops and recorded fragments. His 1988 composition Different Trains begins as a rhythmic evocation of a very personal memory – the pre-war journeys Reich himself used to take as a boy, from New York to Los Angeles, to visit his parents when they no longer lived together. But as the thrilling, chugging strings and confident whistle blasts head west, the focus shifts to wartime Europe and the trains that carried Germany’s Jews to their fate. One commentator has described Different Trains as “one of the few adequate artistic responses to the Holocaust in any medium”, and on 29 September 2016, Steve Reich himself brings this acclaimed piece to Liverpool. After all, if you’re going to muse on the divergent nature of two train journeys – one a personal reverie, the other a global horror – where better to do it than in the place where all significant train journeys began? Edge Hill station is now the first stop after Lime Street, but it was once at the Liverpool end of the world’s first inter-city railway – the revolutionary connection that joined our mighty seaport to the city of Manchester in 1830. The present station buildings date back to 1836, making Edge Hill the oldest passenger railway station in the world which is still in use. The arts organisation Metal has occupied Edge Hill since 2009, and their programme of commissions and residencies has kept the station at the heart of Liverpool’s cultural life ever since. It is Metal who are bringing Steve Reich to the city alongside the filmmaker Bill Morrison, who is creating an archive-driven visual accompaniment to Reich’s piece; together with the London Contemporary Orchestra (LCO), they will turn Edge Hill station into an outdoor concert venue with the kind of pedigree that makes trainspotters weep. For Robert Ames, the co-founder of LCO and one of the performers who will be bringing Different Trains to life, the project is proving to be exciting. One of the innovations that Reich developed in Different Trains was the use of recorded documentary speech to determine the melodies that the string quartet plays. Audio reminiscences were recorded by a range of interviewees, including Holocaust survivors, and fragments of these recordings are woven through the piece; the vocal intonations are picked up by the instruments resulting in a series of see-sawing melodies that pass like words overheard on the breeze. “There’s a lot of speech in the piece,” says Ames, “and a lot of recordings of different trains. One of the most interesting things for me is that we use our instruments to try and imitate the voices of the people who were recorded, which is really cool. As one of the great names of contemporary classical music, Reich’s work is more than familiar to Ames. 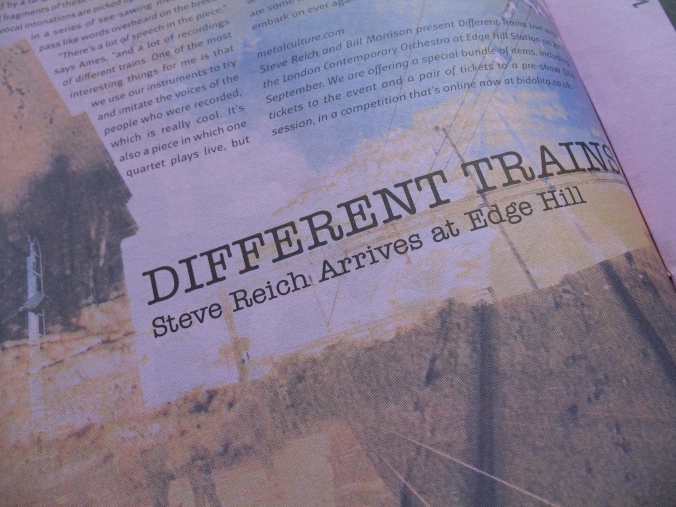 Reich has never previously allowed Different Trains to be performed alongside any accompanying visual elements, but the Edge Hill event is different. The New York-based filmmaker Bill Morrison is using archive footage of American and European train journeys to create a powerful big-screen accompaniment to the music, and though Ames has no involvement in this aspect of the project, he is looking forward to seeing the results. Although Different Trains is the main event at Edge Hill, the evening will also feature a performance of Reich’s wriggling, undulating Electric Counterpoint, played on this occasion by Mats Bergström. Even those who don’t know the piece in its original form have probably heard a snippet of Pat Metheny’s version used as the chief melodic sample on The Orb’s Little Fluffy Clouds. As with Different Trains and many other of Reich’s works, the stark simplicity of the individual phrases belies the complexity of the interwoven whole as elements begin to curl and twist around each other. I ask Ames about the pleasures and challenges of being immersed in music like this – music that can leave the performer frighteningly exposed. It seems then that the stage is set for a memorable night at Edge Hill station, the place where inter-city rail travel can be said to have begun. From childhood journeys across a continent through to the industrial horror of 20th century Europe at war, Steve Reich’s meditation on the places that train travel can take us is a haunting and poignant piece of work. While most of us know what it is to take a train – from Edge Hill perhaps, or somewhere else – we don’t always appreciate the magic and potential inherent in this mundane and routine act. And it’s worth remembering too, as we settle into our seats and whip out our Kindles and iPads and paperbacks, that there are some historical journeys that hopefully no one will have to embark on ever again. This is a slightly longer version of a piece that originally appeared in Bido Lito, the Liverpool music magazine.